← NY Marathon 2014 baby! I have been struggling to put together my race schedule for this year. As of today the only race I have officially signed up for is Ironman Arizona in November of this year. Everything else is up in the air. I have spent the last few weeks deliberating with myself on whether or not to sign up for a race that I probably have no business signing up for. It would be like getting to the start line of the Leadman race I did last year but 10X (may as well be a million for all I know) more difficult. I just know that it will be the hardest thing I have ever done. I doubted myself right up to the 5K swim start at Leadman, thinking I had no business being there. This will be the same but much, much worse. I battle between thoughts of “JUST DO IT” and “AM I F’N CRAZY”! . The race is the Leadville 100 MTB race on August 10, 2012. http://www.leadvilleraceseries.com/page/show/315773-100-mile-mtb-race It takes place in Leadville, Colorado and reaches an elevation of 12,500 feet. For someone who lives at just about sea level it will be no easy task riding in such thin air! No training in the mid-west can properly prepare you for this. If you are a cycling buff watch the movie RACE ACROSS THE SKY it is a documentary on the race. I watched it over the weekend – a lot of hike-a-biking! I haven’t owned a mountain bike in about 8 years since my beloved rockhopper was stolen from my condo bike room in Chicago. BUT, I do love hills! Leadman had two big climbs with an elevation gain of about 6,500 feet and only reached 6,500 feet above sea level. I loved it! And finished despite my haphazard self-coaching! I used to mountain bike back in Ontario. A group of us would do 24 hour relay races, 8 hour rides and some adventure type races so I’m no stranger to mountain biking either. Leadville isn’t crazy technical just high and long! Why do it this year? The training center I belong to – Vision Quest is organizing the trip around the race, they will plan everything for you. This is a huge bonus in and of itself. Typically riders need to arrange for their own support crew at the race. We will have all our nutrition and rooms and transportation arranged. If any of you have traveled for ironmen or other races you know that this stuff is huge. And I know it will be great, did a cycling camp in Santa Rosa California a couple of years ago with them, it was one of my most memorable vacations. I also blame it on fate, before this event was even announced I went for my first mountain bike ride in ages when I was home last summer and it truly gave me the itch to do it again. The seed had already been planted, so when VQ announced they were going I knew that I was meant to do it! (THIS IS ME BEING CRAZY). Why do I want to do it? I love a challenge. I love biking. 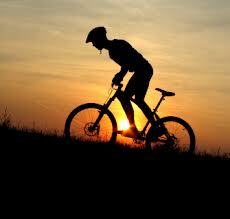 I love mountain biking. I love outdoors. I want to show the world that diabetes is not going to stop me. Although this post has the undertones of doubt- I am over 50% positive that I can finish with the right training. Maybe even 75%. Also, the training would give me a huge cycling base for IM Arizona, which I know is flat but that will make it even easier! What is going to stop me? Buying a new mountain bike . Paying for several bike camps is also not cheap. 25-50% doubt that I won’t finish. Multiple mini-vacations without Tom. Convincing the boss (Tom not Ruby) to let me do it. Second guessing my ability to know my own limitations. So there it is, on paper for the world to see. The sign-up deadline is Feb 1st. I have two days left to decide. Stay Tuned. This entry was posted in Motivation, Training, Uncategorized and tagged Destination Races, Endurance, fitness goals, health, ironman, ironman arizona, LEADMAN, Mountain Biking, triathlon, Vision Quest. Bookmark the permalink.